TOA offers high-quality calls and clear broadcasts for staff announcement, emergency broadcast, and evacuation guidance. Our communication systems overcome the noises from machines and outdoors with high coverage and clarity to ensure the workers can receive the real-time information and work safely. 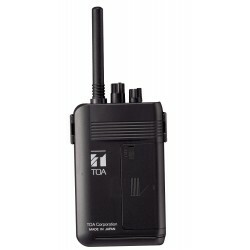 TOA WM-2100 Portable TransmitterTOA's WM-2100 is a Portable Transmitter designed to use 470 MHz band..
TOA WT-2100 Portable ReceiverTOA's WT-2100 is a Portable Receiver designed to receive 470 MHz band r..
YP-M101 Tie-clip MicrophoneThe YP-M101 is a Tie-clip Microphone designed to be exclusively used with..
YP-M201 Close-Talking MicrophoneThe YP-M201 is a Close-talking Microphone designed to be exclusively..
TOA YP-E401TOA's YP-E401 Ear-suspension Earphone is 3.5 mm in plug diameter, and 16 Ω in impedance.S..
WM-2110 Desk-top TransmitterTOA's WM-2110 is a Desk-top Transmitter designed to use 470 MHz band rad..
TOA YP-M301The YP-M301 is a Headset Microphone designed to be exclusively used with an optional WM-2..